If you're in Maryland, you might as well shelve the Balloon Boy costume you've fashioned in the last few days, because Halloween is ruined this year. Why? You still get to go to parties and eat candy and comment on other people's costumes, right? Well, yeah, but there's also a pumpkin shortage in the state. As Jane Bishop prepares her Harwood farm for Halloween, she scatters pumpkins - as many as 16 tons' worth - to set the mood for hayrides and school bus tours. But this year, supplies were so bad that she could only purchase 10 tons and the price was noticeably higher. ONLY 10 TONS! Call the tours off, everybody! Don't go into full panic mode, however. 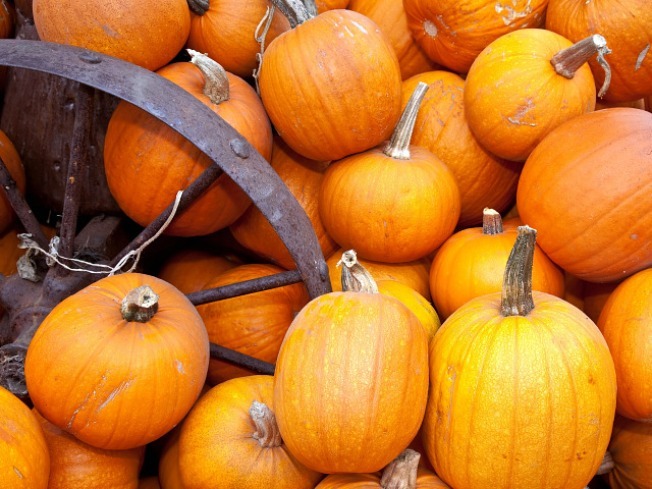 Most farmer claim no one should run into very serious trouble unless they wait until Halloween to get a pumpkin. And honestly, who shows up on Halloween to finally get theirs. Idiots, that's who. So what caused this horrific shortage of squash? Farmers plant pumpkins later in the spring than other crops so they will ripen in October - just in time for fall activities and Halloween. But rains and cool temperatures in late May and June resulted in washouts, disease or simply a slow start. Those early-season problems were compounded by overcast skies during the blossom phase of pumpkin-growing. Bees use the sun to navigate and don't fly on cloudy days, and they were grounded just when the blossoms required pollination. Thanks for nothing, bees. All we wanted was our entertaining pagan holiday and you had to go ruin it by being afraid of the sun.